At this time last year, I was giving my snow boots and winter gear a break for a week and packing up my shorts and tank tops for a weekend of fitness down in Miami, Florida for the Wodapalooza Fitness Festival. In 2016, there were 75 women who qualified for the RX division, and I came in at 74th. It was October and I had just barely squeaked in, but I couldn't have been more motivated to prove I belonged down in Florida come January. I cleaned up my diet, started tracking my macros, and for the first time I was throwing everything I had into this CrossFit thing. I made sure I was sleeping enough at night, drinking enough water, taking my supplements, timing my meals and working my weaknesses into the ground. In six short weeks I had dropped 8 pounds, gotten stronger at the same time, and had improved my muscle-ups and handstand push-ups more than I could have imagined. With a little more confidence and a whole lot of excitement, I set out for my first multi-day competition, and my first one out of New England. The first two days met us with a ton of rain. All the athletes were packed in to a tent and there was mud EVERYWHERE. It could have been raining spaghetti for all I cared though, because being around such amazing athletes at such a fun venue was enough to keep my spirits up. I remember sitting in the athlete area, surrounded by some of my favorites like Margaux Alvarez, the Smith Brothers, and Emily Abbott. I also finally got to meet my favorite athlete of all time, Dan Bailey, and was like a little kid on Christmas morning. I'm not even embarrassed, I'll admit it, I'd been watching these people on TV for three years and now I was sitting in the same tent as them, about to compete on the same floor! Go time. God I hate burpees. The first workout was short and quick with burpees over the bar, thrusters, clean and jerks and more burpees, which as many of you know, is often times the most devastating. The next one I was pretty excited about as it had a few of my favorite things; pistols, GHD's, overhead squats and handstand walks. This one turned out to be my most memorable because it was all neck and neck until the overhead squats. I stopped paying attention after that and just switched into go mode. I realized after I finished my 100 ft handstand walk that nobody else was there yet. I looked around and felt such an amazing sense of accomplishment, like all the hard work I had put in meant something. There's something about competing that puts me in a whole new world. For me, there's no feeling that compares to giving everything I have to a workout, no matter the outcome. 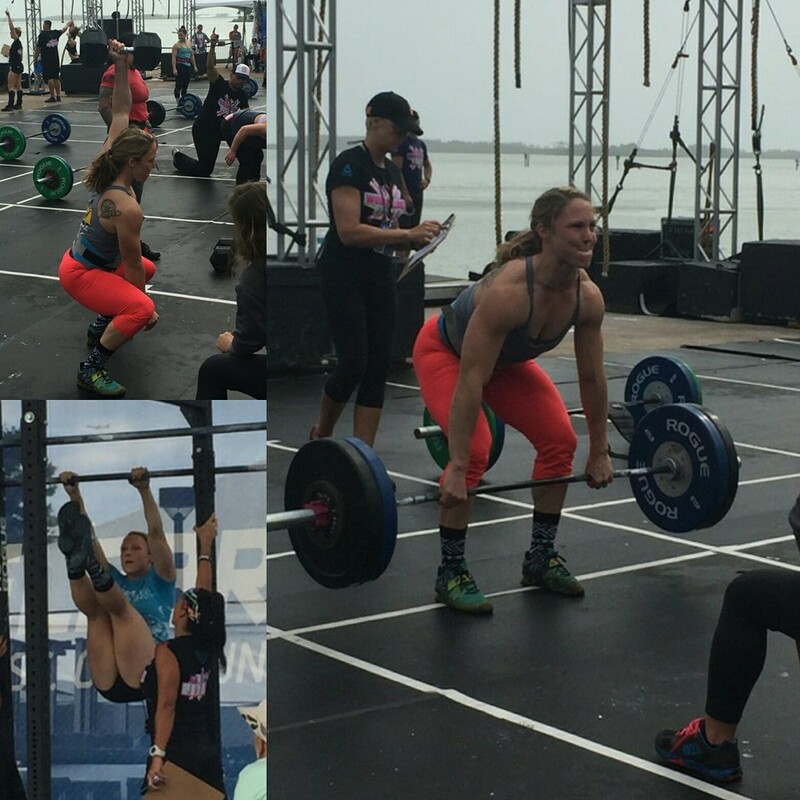 I loved every piece of that weekend, from warming up in the warm-up area, to losing my shoes in the bay, to failing some muscle-ups and handstand push-ups, to almost winning a workout. It's about competing against yourself. Being the best you can be. Wodapalooza was such a ride for me, with some highs and some lows and plenty of new experiences. I remember after the night time swim event, my worst finish of the weekend, I flipped off the barge into the water and swam back to shore. My friends were there waiting and I simply said, "GUYS THAT WAS SO FUN." For me, it was the experience of it all that was just pure joy. The whirlwind of being down in the leaderboard on the first day, to climbing back up, dropping again, and then finishing up on a high note was the most fun I had ever had with CrossFit. Thinking back on that weekend, I learned so much about myself as an athlete; what works for me and what doesn't, how important and powerful a support system is, what I still had to work-on, and how far I had come. This is why CrossFit is such an impactful thing in my life.  It creates an environment where I am my best self.  I am constantly trying to become better, inside the gym and out.  It is a community that goes beyond my city, my state, my country. It is an international community of people who understand each other on such a special level.  It gives me the opportunity to throw myself out of my comfort zone; whether that be pushing myself to my limit in a workout, to meeting and talking to new people from all over the place, or having to figure out something new.  Working on a goal in CrossFit transfers to the way I work for something in my professional and personal life as well; if I can do this, then I can definitely do that.  It gives me an infinite opportunity to travel to places where I can find something familiar, a "family," of sorts. A consistent place where I am confident inside the box and out. With all that said, I hope you see many of the same things as I do about this community as a whole. And with VoyEdge RX, we're cultivating the same 'community' on each one of our trips, which will tire and inspire you. It's all about a tight-knit community who cheer each other on and support everyone, no matter what. Through thick and thin, we got your back.